Men and Monkeys of New Delhi, India | United We Blog! “We are at their mercy,’’ lamented Rajesh Sehgal, a resident of Mayur Vihar Phase II neighbourhood in east Delhi. “The number of monkeys in the locality has increased beyond control in the past couple of years.” Pic by AFP in 2006, Rajpath, New Delhi. It took me a week and three incidents to identify the culprit. I had kept a bucket of household waste just outside the main entrance of my third-floor apartment so that the collector could take it away. One recent afternoon, the collector knocked on my door to show me something. I was horrified. The waste materials were scattered all over the stairs as if it had been done by a monkey. Or could it be the work of the dog that always sleeps at the main entrance three stories below? I wasn’t sure. But last week, I saw him live in action, playing with my kitchen waste, scattering it all over—like a monkey. The culprit was indeed a monkey. For the first time in 20 months, I got the taste of living in Delhi. A bad taste it was, but perhaps not so bad compared to what residents of many other neighborhoods in Delhi are experiencing. Monkeys are creating havoc in their daily lives. “We are at their mercy,’’ lamented Rajesh Sehgal, a resident of Mayur Vihar Phase II neighbourhood in east Delhi. Sehgal is also vice president of the area’s Residents Welfare Association. “The number of monkeys in the locality has increased beyond control in the past couple of years,” he told The Times of India last week. In June, a monkey entered a high security Metro train in Northwest Delhi and delayed the service by 15 minutes. No one was harmed, but members of the Central Industrial Security Force had to intervene to get the monkey out of the train. A cell phone captured the simian’s antics that were fun to watch later on TV, but Metro officials were not amused. “The animal caused a flutter among passengers with everybody running helter-skelter,” NDTV quoted an anonymous Metro official as saying. In a city where 15 million humans live, one could argue, the estimated 10,000 monkeys could hardly create problems. But the disruptive activities of monkeys have discouraged the humans in Delhi to share the city with the primates. Otherwise, sharing was what the monkeys and descendants of apes have been doing since long. Recently unveiled fossils have revealed that the last ancestor shared by monkeys and humans probably lived between 28 and 24 million years ago, several million years later than previously thought. Contradictions in human-simian relationships is clearly evident in Delhi. This city and its Hindu majority residents consider monkeys as gods (Jai Hanuman!) and treat them with varieties of food in temples every week. The Hanuman Temple in Connaught Place, which is believed to have been set up (not in its current form though) by the Pandavas in the Mahabharata days, is always crowded with devotees. On the other hand, Delhi has waged a war against its tailed gods. Authorities have hired several monkey catchers in the past to get the city rid of annoying baandars. 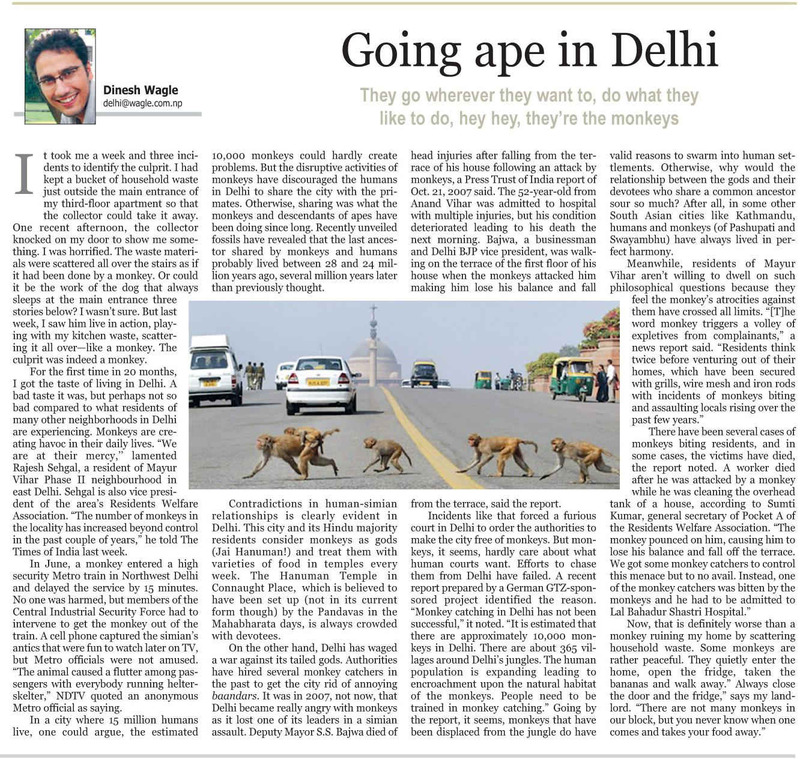 It was in 2007, not now, that Delhi became really angry with monkeys as it lost one of its leaders in a simian assault. Deputy Mayor S.S. Bajwa died of head injuries after falling from the terrace of his house following an attack by monkeys, a Press Trust of India report of Oct. 21, 2007 said. The 52-year-old from Anand Vihar was admitted to hospital with multiple injuries, but his condition deteriorated leading to his death the next morning. Bajwa, a businessman and Delhi BJP vice president, was walking on the terrace of the first floor of his house when the monkeys attacked him making him lose his balance and fall from the terrace, said the report. Incidents like that forced a furious court in Delhi to order the authorities to make the city free of monkeys. But monkeys, it seems, hardly care about what human courts want. Efforts to chase them from Delhi have failed. A recent report prepared by a German GTZ-sponsored project identified the reason. “Monkey catching in Delhi has not been successful,” it noted. “It is estimated that there are approximately 10,000 monkeys in Delhi. There are about 365 villages around Delhi’s jungles. The human population is expanding leading to encroachment upon the natural habitat of the monkeys. People need to be trained in monkey catching.” Going by the report, it seems, monkeys that have been displaced from the jungle do have valid reasons to swarm into human settlements. Otherwise, why would the relationship between the gods and their devotees who share a common ancestor sour so much? After all, in some other South Asian cities like Kathmandu, humans and monkeys (of Pashupati and Swayambhu) have always lived in perfect harmony.